I kind of went for a psychedelic, Balearic feel making the aforementioned guitars all twisty and using the vocal verse of the song as if it were the chorus. The rhythms build a bit and the full brunt of the bass doesn't really kick in until over halfway through (an exercise in patience on my part). I like the idea of the focused bits interchanging with the atmospheric sections, sort of like a camera lens in close-up suddenly pulling back for the wide shot. 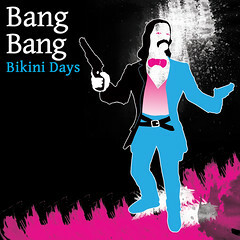 There are other cool remixes of "Bikini Days" from Andrew Phelan & George Cochrane, Gavin Hardkiss, and Bang Bang themselves. You can listen to the single in its entirety by clicking HERE. This single is also available now from Beatport, Stompy, Trassource, and Juno Download. The cover art, by the way, was created by the fabulous Awareinjustice.